When we wake up each morning, we should endeavor to leave more joy in our wake than pain. That should seem obvious, but few do quite as good a job of that than Ruedi Fuhrer’s S2000-powered Honda CRX. Featuring about 280 horsepower of naturally aspirated two-liter ecstasy powering the front wheels, this diminutive 90's hot hatch hero is joy condensed. Surprisingly there is nothing particularly manic about driving this Honda up the hill. With enough mechanical and aerodynamic grip, this short car doesn’t ever seem out of sorts. It’s hooked up and ready to roll. 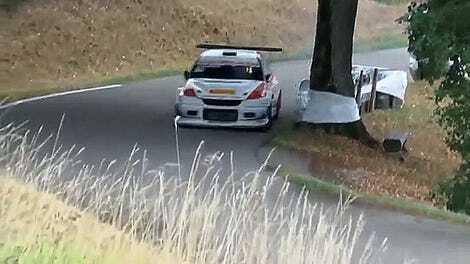 HillClimb Monsters reports that the car weighs less than 1800 pounds all in, which surely helps keep the car composed. For most of the video, this car is little more than a little yellow blur, shooting by as quickly as its stratospheric revving engine will turn the wheels. That F20 engine screaming through the hills at over 9,000 rpm is a great soundtrack to the end of your Thursday. Turn up the volume and have consume pure joy.